What's your first conscious memory? When I was three my family moved from the house where I spent my first few years. I have a couple dozen images of life in that first house clear in my head. So few memories survive the ravages of time. Maybe the ones that do shine a little brighter as the years march by. One memory that stands out for me is this painting. A framed reproduction of it hung over our couch in the living room where my sisters and I spent countless hours playing on the floor. I remember staring at it often. It's funny but I thought at the time that I wished the painting was more colorful and that the artist should have provided more details so we would know what was going on in the painting. Here I am in Washington, D.C. with one of my newest oils, currently hanging in the Corcoran Museum of Art. Oh wait, that was my fantasy speaking. 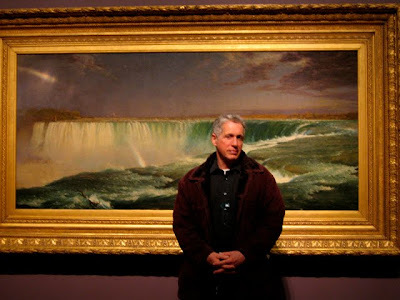 This is actually me with one of my all time favorite paintings, Frederick Church's oil of Niagara Falls. Church is a terrific painter but just to my eye he sometimes gets carried away with telling the viewer a little bit too much information. Not so here. He sticks to water and lots of it. What it remarkable is how solid and flowing the water seems at the same time. If nothing else, the painting is a masterpiece of how beautifully the full range of greens can be used. I am just in awe of what the guy pulled off here. Creative Insight (It Comes Wrapped in a Soap Bubble). 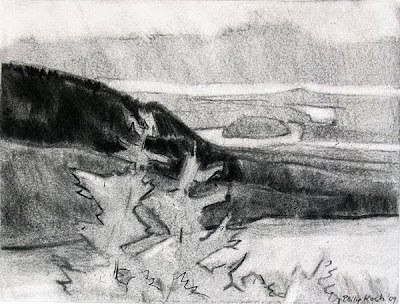 This pair of drawings comes from a very famous spot in American Art History, the summit of Cadillac Mountain in what is now Acadia National Park in Maine. You could raise a football team from all famous American landscape painters who have stood in this spot to paint the view. Frederick Church and Sanford Gifford just to name two. The top charcoal was done on location there this last fall. Just below it is one of the pastel drawings I did in the studio to begin my explorations about turning the original idea into a major oil painting. The pastel was begun on a sheet of paper covered with a thin wash of toned-down ultramarine blue acrylic as an underpainting layer. My idea was to let the cool blues show through in the foreground and middle ground and completely cover the sky with a warm, creamy yellow. Winter: Nature Is Bigger Than We Are! 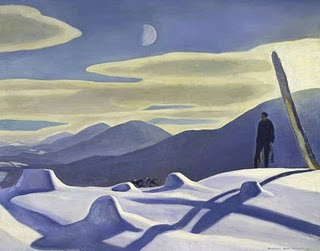 Here's a painting by one of my favorite artists, Rockwell Kent. Partly I like him because he makes me feel so at home. For all of us that means different things, but when I cast my eye back in time to childhood I think of winter and deep snow. My father always wanted to live in the woods and eventually got enough money together to design and build a house on a steep hillside by the south shore of Lake Ontario near Rochester in the town of Webster. I was an impressionable 4 when we moved in, in the snow, in 1952. The property had to be reached by a long sloping driveway with the house at the bottom. Even though we hired a man with a plow to clear us out after major snows, he just would do a rudimentary once over leaving lots of white stuff to deal with. If you didn't get out there and shovel it almost bare, even with a running start from the dry garage, you weren't going to make it up the hill. This is a wonderful little oil by the Canadian painter Lawren Harris from the earlier part of the 20th century. 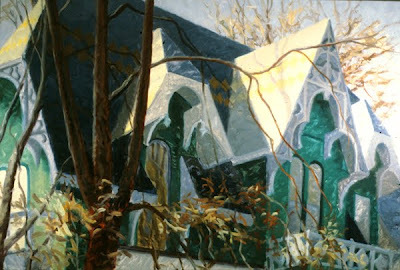 He's a fantastic painter and it is a shame he's so little known in the United States. 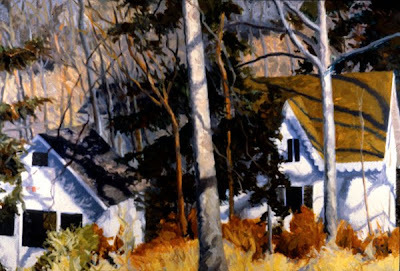 Working at the same time as the American artists Rockwell Kent and Grant Wood, he shared their ability to see the geometric forms in nature and celebrate them while still bathing them in brilliant sunlight. It is a painting about the visual delight that winter brings. As I write this our first major snowstorm in years is sweeping into the Mid Atlantic where I live. 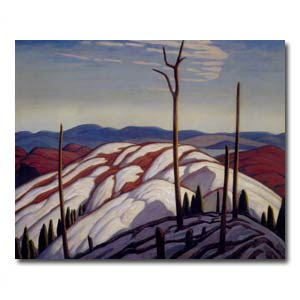 Like Lawren Harris, I grew up in the North and love the look and feel of winter, so this seems a perfect image to open with. I've always been fascinated by old houses, at least the ones that have survived into my time. So many of them have all this extra architectural adornment. Most of it is done inventively and sensitively. Granted these weren't built for the poorest people, but even so it seems the extra expense of seriously decorating the houses was considered necessary. Compare that to the stark box-like constructions that comprise most of our contemporary architecture like your local Target store. Will people in the distant future look back at our time and think "god, what a bunch of dullards they were in the 21st century." This is a house from near my home in Baltimore that honestly always creeped me out a little. It's one of the most ornate around and had been painted with a strange cool green. I imagined the Adams Family takes rooms in it when they're in town. 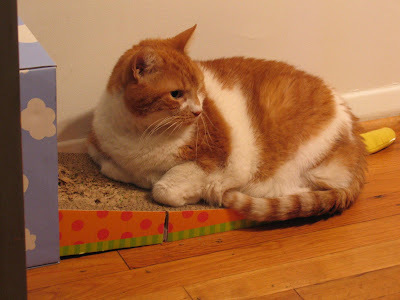 Above is Clifford, my daughter's cat who I wrote about in the previous post "How Do You Know What to Paint?" Shortly after I took this photo he scratched my hand deeply and now I'm sporting a bandage. Would someone remind me what it is I see in these animals? Was reading Stapleton Kearns' blog this morning. Couldn't agree more with his advice advice to get out there and rub shoulders with other artists. I'm always amazed when I stumble across a new good idea from someone else that I hadn't thought of it before myself. Nowadays one of my personal adages is "Nothing is obvious until you notice it." How Do You Know What to Paint? I've been asked many times how I pick my ideas for paintings. Here's part of an answer. This is a scene that still exists but you can't see anymore. It's a house and garage about a mile from my house in the Mt. 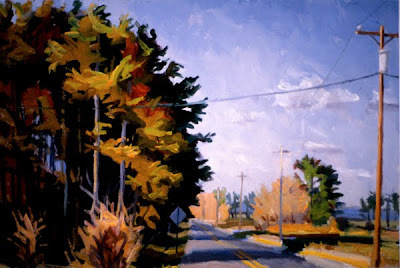 Washington neighborhood of Baltimore where I've done so many paintings over the years. Just a few years after I completed the piece I drove by just to take a look at the source once again and found it completely hidden by the saplings and brush reclaiming the front yard. I love that.
" Whispered Promises and the Change in the Light"
More scans of slides from the not so distant past. I'm encountering paintings I haven't seen in some time and am really enjoying them as old friends. The title of this post is a line from an old Jackson Browne song. It is something of a theme song of painting. Oil painting is a slow process. That is one of its strengths. It teaches you patience- to wait and keep looking for something special to reveal itself. The longer I paint (or live for that matter) the more I value timing and pacing of oneself. Both art and life are tricky, and the headlong rush of wanting to complete something sometimes needs to be held in check. We prepare with some judicious watching and waiting until the time is just right. Especially us landscape painters, the chroniclers of the changing lights of day. More trolling through my older paintings as I scan the bin of slides from my studio. This was painted from on oil study I did up in Norfolk, CT in the extreme northwest corner of Connecticut where the hills begin ramping up enough to be called mountains. 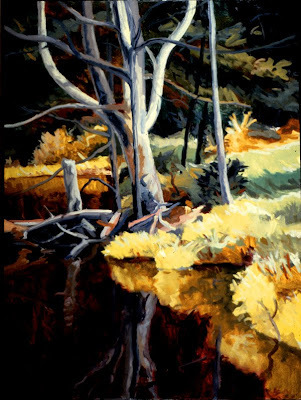 Like so much of New England, the forests have reclaimed most of the abandoned farm fields so when looking for places to paint one's eye is caught by beaver ponds. For just this reason, I've painted lots of these remarkable natural clearings. I've been scanning slides of my older paintings again to save them as digital files (kicking and screaming, I'm being dragged into the present day...). 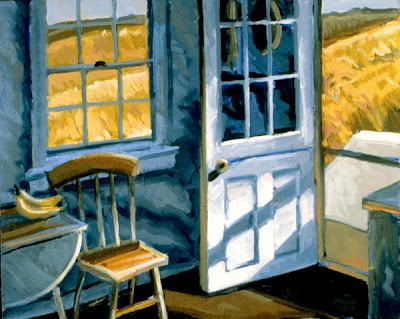 Here's one I scanned yesterday of a favorite painting done on my French easel in the kitchen of Edward Hopper's old painting studio in Truro, MA, on Cape Cod. It was done on one of the recurring residencies I've enjoyed in the place. Spending time there you discover little truths about this formidable painter.